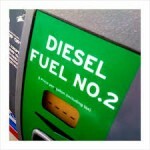 The cost of diesel is below the price of gasoline for the first time since 2009. Gasoline prices peak in spring/summer due to driving, while diesel demand peaks in autumn and winter due to agricultural activity and winter heating. Therefore, the price gap is widest in January and smallest in summer. Additionally, global demand for gasoline is skyrocketing while it’s falling for diesel, yet refiners can’t avoid making both simultaneously.